Home » Science » Crashed alien spacecraft spotted on Mars? Crashed alien spacecraft spotted on Mars? 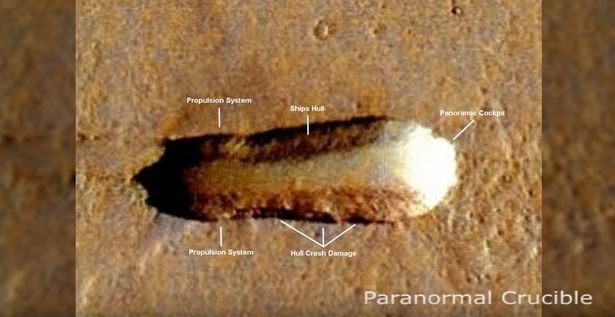 A new video has emerged on the internet that claims to have found evidence of a crashed alien mothership on Mars’ surface. The images from the video were found in footage taken from NASA’s Mars Global Surveyor – which surveyed the red planet until 2006 when the space agency lost contact with it. “I have processed, colorized and rebuilt the object and in my opinion it is a craft of some kind, possibly tens of thousands of years old,” explains the description underneath the video . Some commentators have poured cold water on the theory, insisting it is only a piece of raised ground or a rock formation. But the UFO hunters behind the channel are convinced of its authenticity. “The object is too degraded to enhance totally so I have rebuilt it using the points of interest that are shown in the video,” the video states. The outlandish video has been viewed more than 8,000 times. It’s not the first time conspiracy theorists have claimed an alien civilisation is living on the red planet. Strange domes and rock outlines resembling human-like items are often picked up on as evidence of pareidolia: when the brain is tricked into seeing familiar sights in strange objects.